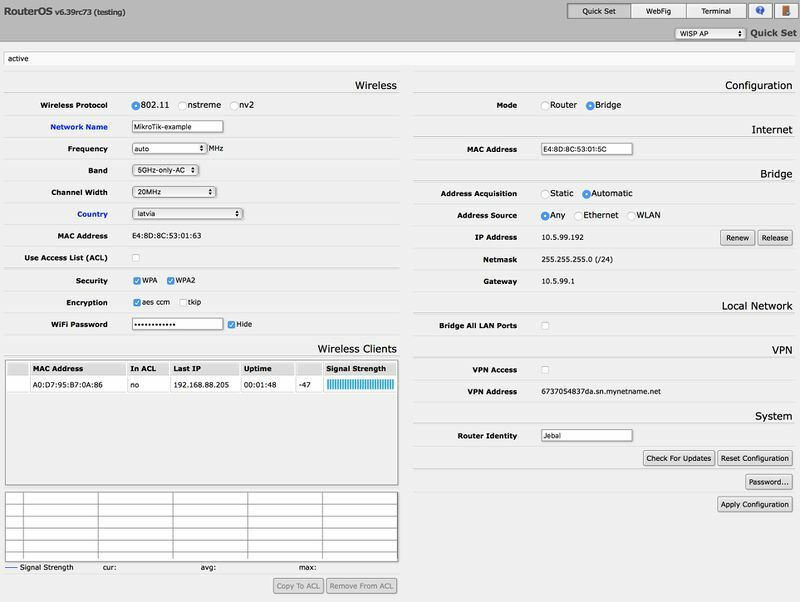 Mikrotik first time setup – Kattieh Dynasty Ent. Every router is factory pre-configured with the IP address 192.168.88.1/24 on the ether1 port. The default username is admin with no password. After you log in for the first time, please create a new user with a password in the “full” group, re-login and delete the default admin user. We highly recommend you to follow the general guidelines of the articleSecuring your router to protect the device from any unauthorised access. Run the Winbox utility, then click the […] button and see if Winbox finds your Router and it’s MAC address. Winbox neighbor discovery will discover all routers on the broadcast network. If you see routers on the list, connect to it by clicking on MAC address and pressing Connect button. If winbox cannot find any routers, make sure that your Windows computer is directly connected to the router with an Ethernet cable, or at least they both are connected to the same switch. As MAC connection works on Layer2, it is possible to connect to the router even without IP address configuration. Due to the use of broadcasting MAC connection is not stable enough to use continuously, therefore it is not wise to use it on a real production / live network!. MAC connection should be used only for initial configuration. Command Line Interface (CLI) allows configuration of the router’s settings using text commands. Since there is a lot of available commands, they are split into groups organized in a way of hierarchical menu levels. Follow console manual for CLI syntax and commands.